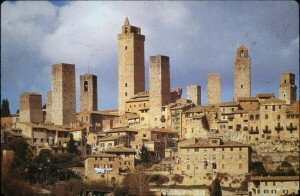 The towers of San Gimignano. See how I could have gotten confused? 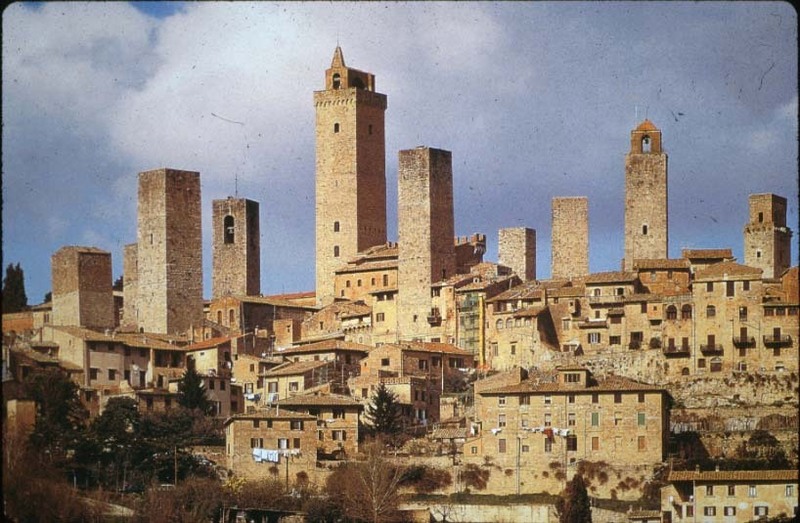 San Gimignano is a small village in the Chianti producing district of Tuscany, not far from Voltera. When I first saw it in the distance it looked like a series of skyscrapers against the horizon. However, I caught myself, realizing there could be no skyscrapers here, and when I looked again, there was only a series of stone towers which, because of distance and scale, had fooled me into believing I was seeing what couldn’t be there. No cars being permitted in San Gimignano, I parked the Fiat outside the wall of the town and walked through a narrow, cobble-stoned street into one of the loveliest of Medieval towns. There were signs advertising this or that Etruscan museum, and we tried to see them all, but in the central piazza was a big sign advertising a performance of Giuseppe Verdi’s opera, Nabucco, the following day. It is impossible to love opera and not to love Verdi. When he died, in 1901, his funeral brought together the largest crowd in Italian history to this day. Verdi and the Risorgimento (the revolutionary movement that freed Italy from the Hapsburg yoke and united Italy in the 1860’s) went together. Viva Verdi had become a political slogan, which stood for Viva Victor Emanuel Rei d’Italia, expressing the wish that the then king of Sicily become the king of a free Italy. 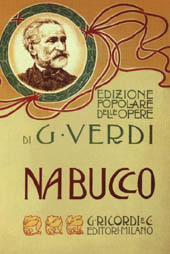 At Verdi’s funeral some anonymous person had begun singing the haunting chorus of the Hebrew Slaves in Babylon, probably the most famous chorus in Nabucco, and was soon joined by the entire crowd of over thirty thousand, all of them singing Va pensiero. . . Every one knew it, because it had become the unofficial anthem of the Risorgimento. The story still gives me goose pimples. And here we were, Linda and I, in Italy, and there was going to be a performance of Nabucco which we would not be able to attend. We wandered around the ancient town, and somehow Linda and I became separated. I returned to the central square (actually it was a circle) and had a glass of Chianti at one of the tavernas in the piazza. While enjoying my wine, I thought I heard some singing. It was faint, far away, but I decided to investigate. I paid my bill and followed the sound of the singing, which got louder as I neared it, and suddenly found myself in front of a door from which the singing seemed to be coming. I entered. By now the singing was quite loud, and I walked on until I came to a large, cave-like basement in which the entire cast of singers and other musicians were rehearsing for the next day’s performance of Nabucco, and what they were rehearsing was Va pensiero . . . I stood there, transfixed. I couldn’t get to the opera the following night, but I got the next best thing. Now I have a confession to make. The story about the crowd at the Verdi funeral singing Va pensiero isn’t strictly true. It is even quite false. But I really believed it at the time. Yes, there were some who gave political significance to that chorus, but it was not intended to be so by Verdi, just as his name was only accidentally an acronym. The music at Verdi’s funeral cortege was Mozart’s Requiem, but I still feel it should have been Va pensiero.